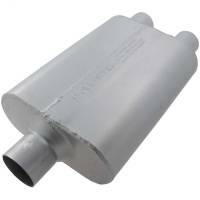 In 1983, Flowmaster founder Ray Flugger created Flowmaster's first patented design of racing muffler. 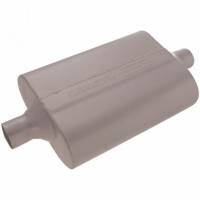 Pit Stop USA sells all the products you need for your 3/4 and 1-ton GMC or Chevrolet Trucks including Mufflers and Resonators. 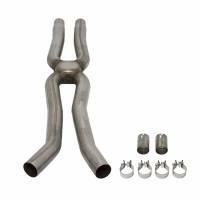 Pit Stop USA has all of your Street Performance needs including Chevrolet Monte Carlo Exhaust. Flowmaster 10 Series Delta Force ASA Spec Muffler - 3.5" Center Inlet, 3.5" Center Outlet - Aggressive Sound - 6.25" x 9.75" x 4.00"
Flowmaster 10 Series Delta Force Race Muffler - 2.5" Center Inlet, 2.5" Center Outlet - Aggressive Sound - 5.75" x 8.00" x 3.00"
Flowmaster 10 Series Delta Force Race Muffler - 3" Center Inlet, 3" Center Outlet - Aggressive Sound - 6.25" x 9.75" x 4.00"
Flowmaster 10 Series Delta Force Race Muffler - 3" Offset Inlet, 3" Center Outlet - Aggressive Sound - 10.25" x 9.75" x 4.00"
$22.95 Flat Rate Shipping! Oversized / Overweight Item. Ships from Michigan. $14.95 Flat Rate Shipping. Ships from Michigan. Flowmaster 30 Series Delta Force Race Muffler - 3.5" Offset Inlet, 3.5" Center Outlet - Aggressive Sound - 17.25" x 12.00" x 5.00"
Flowmaster 30 Series Delta Force Race Muffler - 4" Center Inlet, 4" Center Outlet - Aggressive Sound - 14.00" x 12.00" x 5.00"
Flowmaster 30 Series Delta Force Race Muffler - 4" Offset Inlet, 4" Center Outlet - Aggressive Sound - 17.25" x 12.00" x 5.00"
Flowmaster 40 Delta Flow Muffler - 3" Offset Inlet, 3" Offset Outlet - Aggressive Sound - 13.00" x 9.75" x 4.00"
Pit Stop USA is The Online Motorsports Superstore! 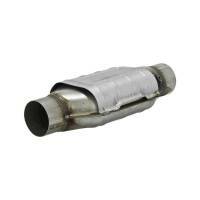 We feature Flowmaster Mufflers, Flowmaster Racing Mufflers and Flowmaster Exhaust Systems. In 1983 California Sprint Car racers were experiencing 'excessive sound' issues and were told to quiet the cars down or stop racing. 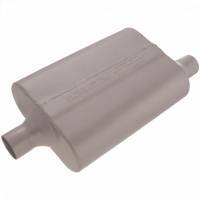 Flowmaster founder Ray Flugger created Flowmaster's first patented design of racing mufflers. Ray attached handles to ease carrying the race mufflers, and the mufflers became known as the "suitcase muffler. Today Flowmaster is dedicated to building the highest quality U.S. made exhaust products available. The aFlowmaster Sounda is the true tone of American muscle and performance. 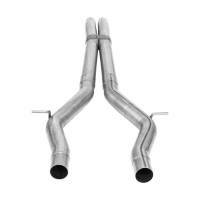 What makes Flowmaster so unique is that its performance improvement is paired with its unique exhaust tones. 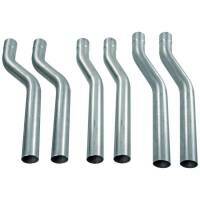 The aFlowmaster Sounda is offered in many different tones depending upon the muffler series. 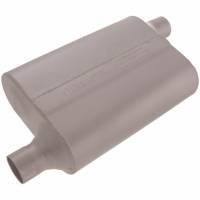 From the deep, aggressive tone of the Super 44 a" to the quiet and subtle, but unmistakably rich Flowmaster tone of the 70 Seriesa", Flowmasters family of mufflers offer the right application of performance and sound you want. 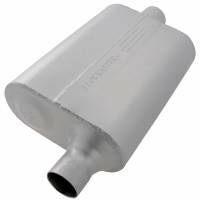 Flowmaster operates the only exhaust Research & Design facilities of its kind in the world and also utilizes Spectrum Analyzers to fine "tune" the sound of each series of mufflers, both for peak performance and just the right sound levels and tones. 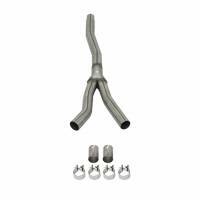 Flowmaster offers you the choice of sound to fit your sound preference from "wild to mild" and of your specific vehicle needs. We feature Flowmaster Delta-Force Race Mufflers, Flowmaster Scavenger Series Race Mufflers, Flowmaster Scavenger Collectors, Flowmaster Low Profile Mufflers, Flowmaster Delta Flow Stainless Steel Mufflers, Flowmaster American Thunder Exhaust Systems, Flowmaster Force II Exhaust Systems, Flowmaster 40 Series Delta Flow Mufflers, Flowmaster 40 Series Mufflers, Flowmaster Super 40 Series Mufflers, Flowmaster 50 Series Delta Flow Mufflers, Flowmaster Stainless Steel Mufflers and more at low everyday prices!